Competitive keyword advertising—buying ads triggered by a keyword search for a competitor’s trademarks at venues like Google AdWords, Yahoo and Microsoft’s Bing—has generated enormous legal angst over the past decade, including hundreds of law review articles, occasional legislative proposals and countless lawsuits. Despite this, many commentators (including me) have questioned how competitive keyword advertising harms consumers. A new independent consumer survey gives further reason for skepticism. 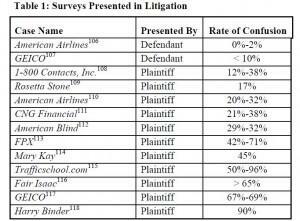 The survey finds little evidence of consumer harm, and it prompts questions about the economic wisdom of bringing lawsuits over competitive keyword advertising. With this kind of “research,” we desperately needed an independent survey that wasn’t financially sponsored by a litigant. To our rescue comes Profs. 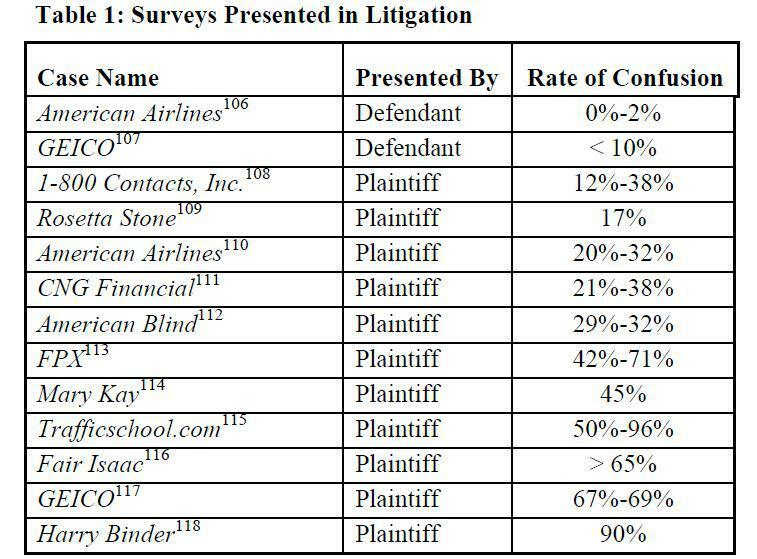 David Franklyn (USF) and David Hyman (Illinois), who conducted three independent consumer surveys and now present the results in their newly posted article, Trademarks as Keywords: Much Ado About Something? I encourage you to read the article in its entirety (and form your own opinions about the credibility of its methodology). In this post, I’ll highlight two of their findings. Many brand owners believe the opposite: consumers who use their brands as search keywords must want their brands–and only their brands, not their competitors’ offerings. But consumers deploy many search strategies, including using a well-known brand as a “proxy” for the class of goods. Imagine this: what synonyms would you use to search for goods similar to “The Clapper” or “Slinky“? When there aren’t good synonyms, using the brand as a proxy search term makes sense. But even when there are obvious generic synonyms, consumers still might choose a branded search term. For example, if you already know you like the Nikon Coolpix p510, you might choose to search on that term, rather than searching on generic keywords like “digital camera,” as the fastest way to find the model’s close competitors. I explore this issue in some detail in my 2005 article, Deregulating Relevancy in Internet Trademark Law. With this in mind, giving brand owners the legal power to control search results isn’t in the consumers’ best interests. Instead, brand owners’ efforts to suppress competitive keyword advertising raise anti-competitive concerns. Many consumers want to see competitive options in their search results (as the article says, “a majority of consumers use brand names to search primarily for the branded goods, but most consumers are open to purchase competing products”), but that’s exactly what brand owners don’t want them to have. In Storus v. Aroa, the defendant advertiser got 1,374 clicks over 11 months. Based on the low cost of the goods at issue, I estimate each click was worth about $1–making the lawsuit’s value less than $1,400. In King v. ZymoGenetics, the defendant advertiser got 84 clicks. In Sellify v. Amazon, the defendant got 1,000 impressions and 61 clicks. In 800-JR Cigar v. GoTo.com, the search engine defendant generated $345 in revenue (not profit, just revenue) from the litigated terms. In 1-800 Contacts v. Lens.com, Lens.com made $20 of profit from competitive keyword ads. 1-800 Contacts unsuccessfully tried to hold Lens.com responsible for affiliate ad buys which generated about 1,800 clicks, which under the most favorable computations were worth about $40,000. 1-800 Contacts spent no less than $650k (and was willing to spend $1.1M) on its lawyers in this case. Finally, in InternetShopsInc.com v. Six C, the defendant got 1,319 impressions, 35 clicks and zero sales. To me, the lessons are clear. Brand owners usually are wasting money–often, a LOT of money–bringing lawsuits over purportedly lost business attributable to competitive keyword advertising. In fact, there’s good reason to believe that brand owners lose little, if any, profits from the practice; and even if they do, the costs of the law vastly exceed those lost profits, making the litigation unprofitable. This article gives brand owners more reasons to question the cost-benefit of litigation over keyword advertising.